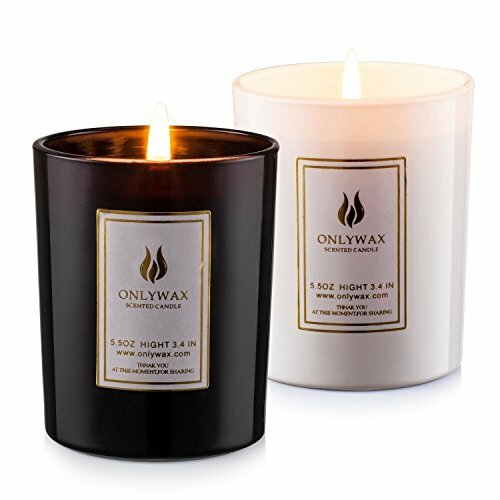 Save 1% on the Scented Candles Lavender and Vanilla with Natural Essential Oils, 100% Eco-Friendly Soy Wax Aromatherapy Candle, Romantic Wedding Creative Birthday Gift Fragrances Candle (2 Pack) by Onlywax at Oxygen Salon and Spa. MPN: unknown. Hurry! Limited time offer. Offer valid only while supplies last. Vanilla&Lavender Scented Candles Net Contents: 5.5 oz. Glass size: 2.8'' x 3.25''. scented wax tablets size:3'' x 2'' Approximate Burn Time: 50 hours. Net Contents: 5.5 oz. Glass size: 2.8" x 3.25". scented wax tablets size:3" x 2"
100% Soy Wax provides a clean burning candle,This candle is made with naturally biodegradable and eco-friendly pure soy wax. The candles are hand poured wax infused with essential oils to create a highly fragrance Aroma. The beautiful glass design makes it the perfect complement for any decor, and any room of the house ~ bedroom, bathroom, family room, great room or Kitchen. Great Birthday Gift, Home Warming Gift or Father's Day Gift for Mom, Aunt, Sister, Grandma or Wife. 1. To prevent fire burn candle within sight. Keep out of reach of children and pets. Never put on or near any thing that can catch fire. ★【100% SOY】This candle is made with naturally biodegradable and eco-friendly pure soy wax. ★【Burn clean & Last long】5.5 Oz each. Glass size: 2.8" x 3.25". Scented wax tablets size: 3" x 2". ★【High end summer outdoor/Indoor decor】 These are perfect for adding a decorative touch to any room's decor. Perfect for everyday use, wedding, events, aromatherapy,spa, reiki, meditation, bathroom setting. ★【100% SATISFACTION】 If you are not completely thrilled with the fragrance or appearance of these candles, just ship them back (at our expense) and we'll give you a full refund. No hassles. No headaches. If you have any questions about this product by Onlywax, contact us by completing and submitting the form below. If you are looking for a specif part number, please include it with your message.